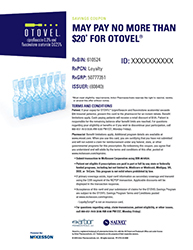 Patient: If your co-pay for OTOVEL exceeds $20 (insured patients), present this card to the pharmacist for an instant rebate. Benefit limitations apply. Cash-paying patients will receive a retail discount of $188 per box. Patient is responsible for the remaining balance after benefit limits are reached. For questions regarding your eligibility or benefits or if you wish to discontinue your participation, call 877-264-2440 (8:00 AM-8:00 PM EST, Monday-Friday). Pharmacist: Benefit limitations apply. When you use this card, you are certifying that you have not submitted and will not submit a claim for reimbursement under any federal, state, or other governmental programs for this prescription. By redeeming this coupon, you agree that you understand and will abide by the terms and conditions of this offer, posted at www.mckesson.com/mprstnc. Patient not eligible if prescriptions are paid in part or full by any state or federally funded programs, including but not limited to, Medicare or Medicaid, Medigap, VA, DOD, or TriCare. This program is not valid where prohibited by law. If primary coverage exists, input card information as secondary coverage and transmit using the COB segment of the NCPDP transaction. Applicable discounts will be displayed in the transaction response. Acceptance of this card and your submission of claims for the OTOVEL Savings Program are subject to the OTOVEL Savings Program Terms and Conditions posted at www.mckesson.com/mprstnc. LoyaltyScript® is not an insurance card. For questions regarding setup, claim transmission, patient eligibility or other issues, call 877-264-2440 (8:00 AM-8:00 PM EST, Monday-Friday).